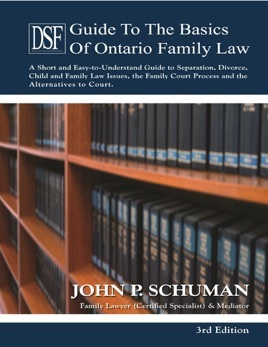 Are you separating You have no idea what to expect What does getting married really mean The Guide to the Basics of Ontario Family Law is for everyone who: is separating or divorcing, need to change an order or separation agreement, are involved with a children's aid society, are getting married or living "common law", or need to understand Ontario Family Law. It explains what to do after separating and then describes each step in the Family Court. The up-to-date explanations also include: alternatives to court, mediation, arbitration, collaborative law, and negotiation. Get an overview of Ontario Family Law for both for separated couples and people getting married. Discussions include: custody/access, child & spousal support, property division, restraining orders, marriage contracts/cohabitation agreements and other issues. There is help with children's aid society problems and adoption. The Guide has quick advice to avoid family court and tips on what to do, and not do, to get the best results possible.